Toronto to Prague, Czech Republic - $553 CAD roundtrip including taxes | one seat? Jet Airways is showing one flight from Toronto to Prague, Czech Republic for $553 CAD roundtrip including taxes. It looks like there may just be 1 seat, on one particular set of dates. Maybe a solo traveler can use it. Sep 7 to Sep 14 or 21 also works, but has a 12 hour layover in Amsterdam on the way there. On these dates, it appears there is currently more than just 1 seat available. 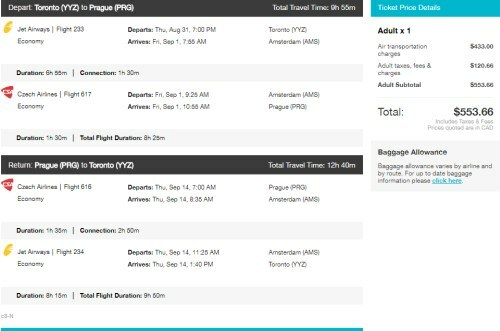 If you try the same search on Momondo, you'll see that Tripsta is claiming to be able to book it for $495 CAD roundtrip. toronto, yyz, flight deals, europe, jet airways, prague, prg and czech republic.